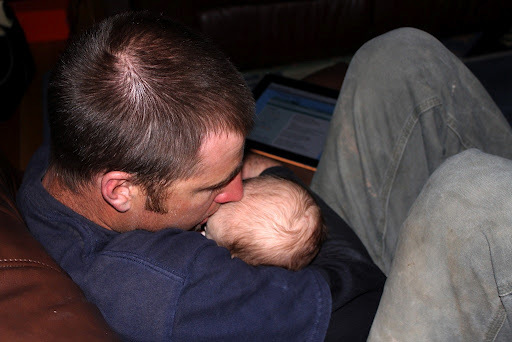 Me cooking, Daddy and baby rocking and singing… it’s so ridiculously cheesy and idyllic, and I love every minute of it. I thank God, my amazing RE, my parents, and the luck of the draw every day for making this little scene possible. ooooh! She's pissed at you in that first picture! :-)Happy times! Tonight after dinner, N and I were playing hide and seek with Arlo. This basically consists of us hiding in pretty much plain view, and then popping out to surprise him when he approaches. He laughs hysterically–big belly laughs with the deepest of dimples. And tonight I had that same feeling you describe here. I kept thinking, "How on Earth am I this f***ing lucky, to have this moment, exactly what I always wanted?" Happy weekend! Those are the best moments! 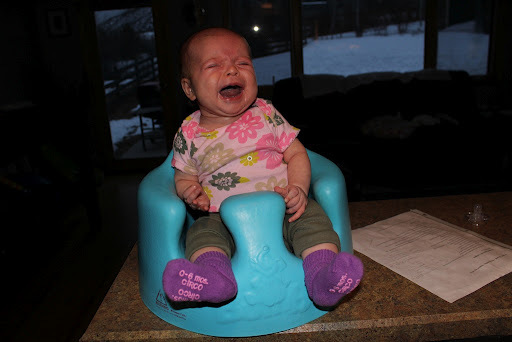 And how is she sitting in the Bumbo already, wow, strong girl! My heart melts. Your family is so precious.